Martha’s Vineyard is an island 7 miles off the coast of Cape Cod, and is a particularly popular summer destination. It is reachable by air or ferry. The year-round population is 16,000, but swells to more than 100,000 in summer. 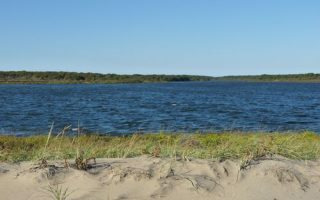 The island is known for its quaint villages, gorgeous beaches, the cliffs of Gay Head, and the agricultural interior areas of West Tisbury. Our running guide for Martha’s Vineyard, Massachusetts includes beachside trails, bike paths, state parks, and lovely residential areas, offering a wide variety of options. 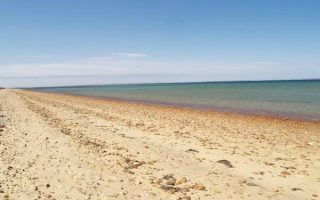 Some highlights are South Beach State Park, waterfront views along East Chop Drive in Oak Bluffs, the bike path along State Beach, and Manuel F Correllus State Park for a nice, woodsy trail run. Martha’s Vineyard is divided into six towns: Toney Edgartown is the population center and largest commercial area, known for its whaling tradition; Oak Bluffs is festive and rambunctious, known for its gingerbread cottages; Tisbury is home to Vineyard Haven Harbor and the island’s year-round ferry terminal; West Tisbury is the agricultural center; Chilmark includes the fishing village of Menemsha, and has the hilliest terrain; and Aquinnah is the location of Gay Head and the clay cliffs. 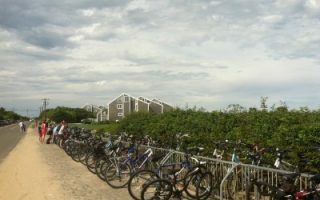 There are bike paths in many sections of the island, especially connecting Vineyard Haven, Oak Bluffs, Edgartown, and out to South Beach. The Vineyard Transit Authority (VTA) offers excellent bus service, especially in season, making possible one-way runs! For additional information on exploring Martha’s Vineyard check out vineyardvisitor.com, the Insider’s Guide to Martha’s Vineyard. It’s a fantastic resource! 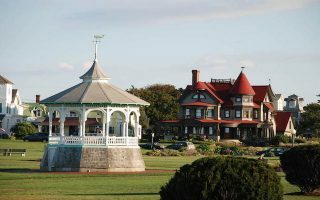 A 'runseeing' tour of Oak Bluffs: waterfront sections around the harbor and Seaview Ave., festive Circuit Ave., spectacular homes around Ocean Park, famous gingerbread houses, and for a longer run, a loop around the Land Bank Trails. One of Martha’s Vineyard’s most beautiful waterfront roads. Beautiful waterfront views and classic homes. A highlight is East Chop Lighthouse. This run can be done there and back or as a loop for through Oak Bluffs for the return. 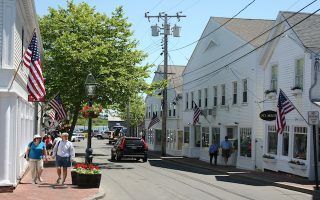 Tony Edgartown is the historic and commercial center of Martha's Vineyard. Develop your own route incorporating Lighthouse Beach, whaling captains' homes along Water St. and the leafy side streets with quaint homes, shops, & inns. Quintessential Martha's Vineyard Run for 5 miles along Beach Rd., between Oak Bluffs and Edgartown. Bike path most of the way. Views of the ocean and Sylvia State Beach. Site of several Jaws scenes. There are gorgeous beaches on Martha's Vineyard. Several variables influence how 'runnable' these beaches are -- weather, tides, etc. 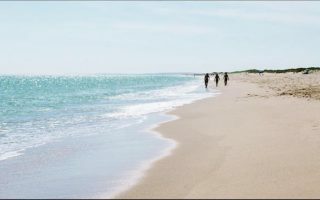 South Beach, Joseph Sylvia State Beach, and Aquinnah offer the best running possibilities. 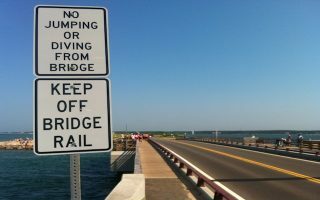 Let the rest of the family schlep the beach gear and deal with parking while you run the 2.6 miles from Edgartown to South Beach on Katama Rd., with a bike path the whole way. A full loop run is 6 miles, including 1 mile along Atlantic Dr.
Lovely refuge area near South Beach with 600 acres of beaches, dunes, and woodlands. About 2 miles of running trails, more if beach is added. 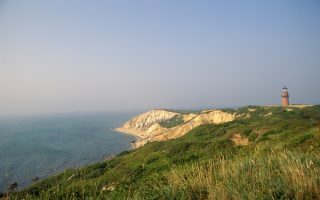 Aquinnah is the wild and scenic tip of Martha's Vineyard. There are cliffs and a lighthouse at the tip. The best running here is the 3.6 mile Moshup Trail, a road that goes from State Rd. to the tip. 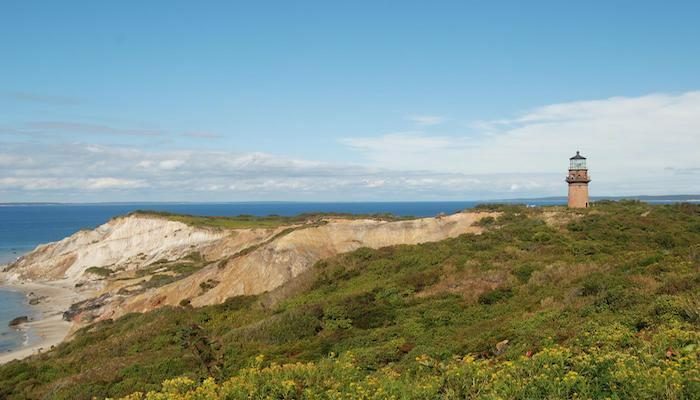 We've also designed a 10-mile tour of Aquinnah. Pleasant run for 3.2 miles out and back along the ocean, using Lobstervlille Beach Rd. In season, a bike ferry will take you over to Menemsha. 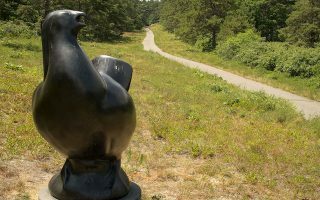 Created in 1908 as a “Heath Hen Reserve” in an effort to save the bird from extinction. There are 5,300 acres for numerous activities, and 14 miles of paths suitable for running. A bit hilly and good shade option for a hot day. Martha’s Island weather is similar to that of Cape Cod. It is heavily influenced by the ocean, and is quite different than Boston’s. Summer, the most popular season for visitors, is generally delightful, with less heat and humidity than most of the east coast. 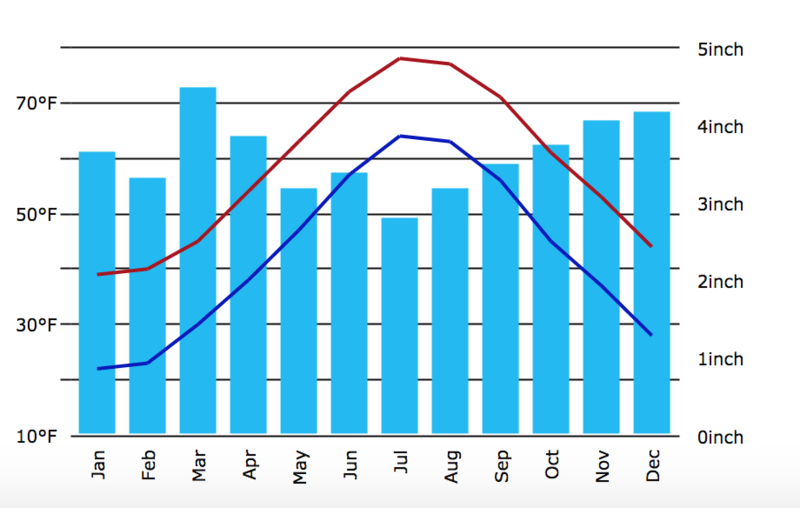 July-August average highs are in the high 70sF (25C), and nights are warm but not hot. Rainfall is less frequent than in Boston, due to fewer heat-driven thunderstorms. Fall is gorgeous, with pleasant, mild weather lingering into early November. The ocean has a big influence in winter. It is generally damp and chilly, with cold winds. Nor’easter storms can be ferocious, although the Vineyard receives an average of only 25″ of snow a year. Many winter storms produce a kitchen sink of snow, sleet, and rain. Spring can be frustrating, as the cool ocean and northeast winds can keep the skies cloudy and the temps cool well into May. Martha’s Vineyard is a major tourist destination, so there’s a big choice of places to stay…just don’t expect big hotels. 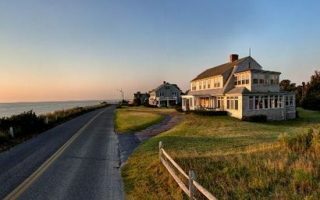 The three most popular areas to stay are in Edgartown, Oak Bluffs, and Vineyard Haven. Vineyard Visitor, a great source of information for all things Vineyard, has put together a comprehensive list of places to stay on the island. See their page here. Vineyard Visitor has a great calendar of events on the Vineyard, across all sorts categories of activities. Here’s a link to their ‘sports and events’ calendar!